Loosening up and trying to draw better cars and trucks (overstated them a bit!) 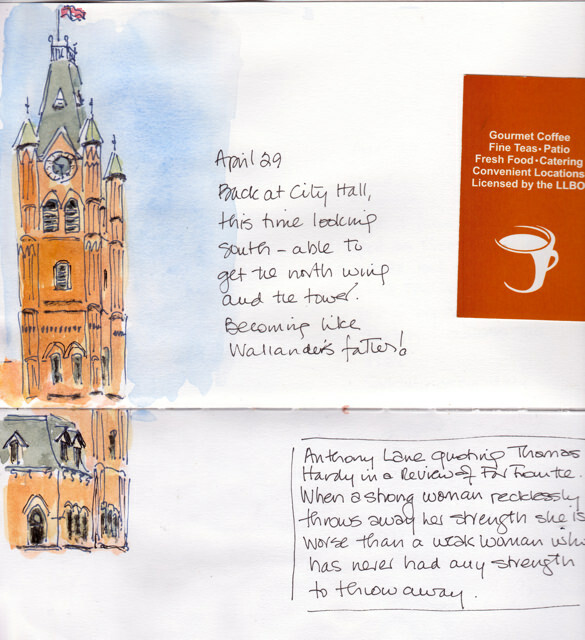 Monday morning coffee post exercise–view out the café window on a damp morning. 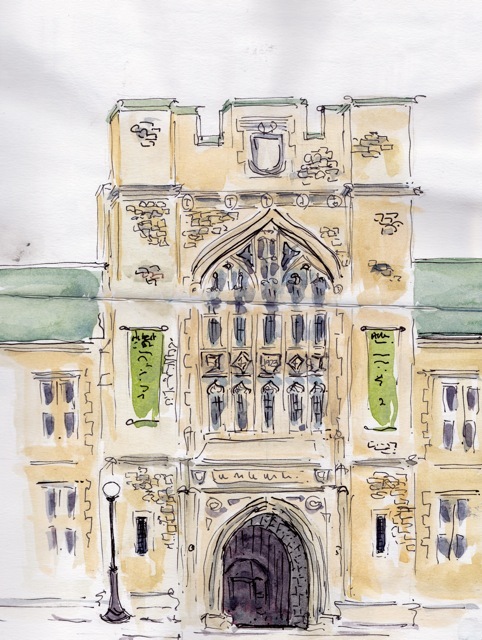 Below an iconic landmark a block from my house–rode over on my bicycle Sunday and sketched sitting on the lawn. 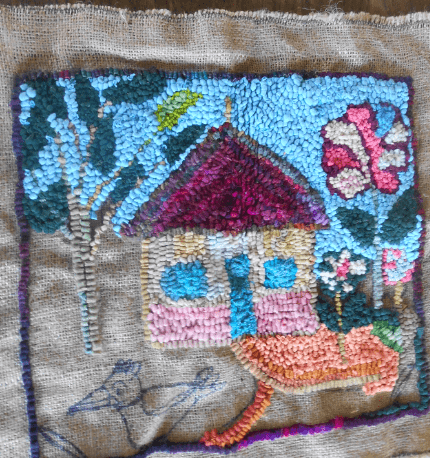 I was delighted to receive an email this week with photos of hooking done by the women in Matangwe since February. The pieces took me right back to the big table in the Community Centre and the 16 women hooking and chatting in Luo. It was a great privilege to work with them and to help them develop their own style and colour sense. Remember, they are working with burlap and minimal fabrics–whatever they can find at home or at the local market–are cutting each strip with scissors and hooking without a frame or hoop. And they lead busy and difficult lives. Yet the pieces they produce are of great charm and unique design. More pictures of the rug hookers of Matangwe can be found here and here. I am looking forward to our gallery show in September when all the pieces will be mounted and displayed. More details on that closer to the time. 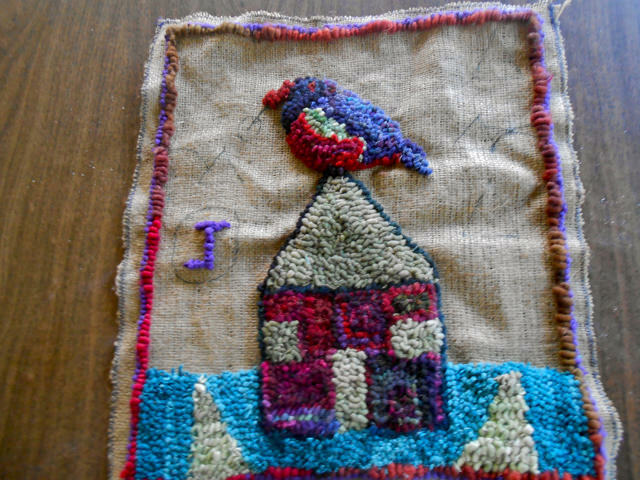 And in the meantime, check out the bird in the third piece; it’s not hooked yet but it will make you smile. 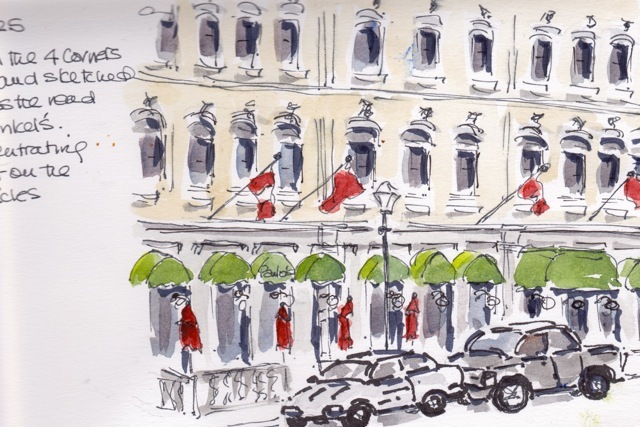 Victoria Day in Canada is always a welcome holiday. Cottages are opened and gardens are planted. We have been home this weekend and so I was able to do a little sketching, a little cycling and some sewing on the kiwi leather. 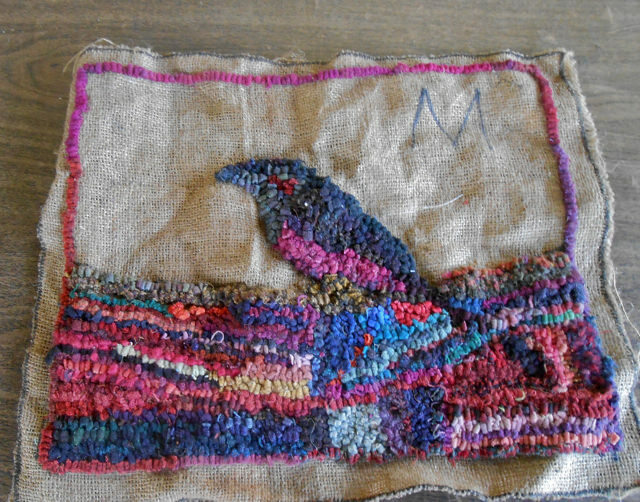 This is bag number two from the remnant piece I had. And this one, a satchel style, turned out particularly well. 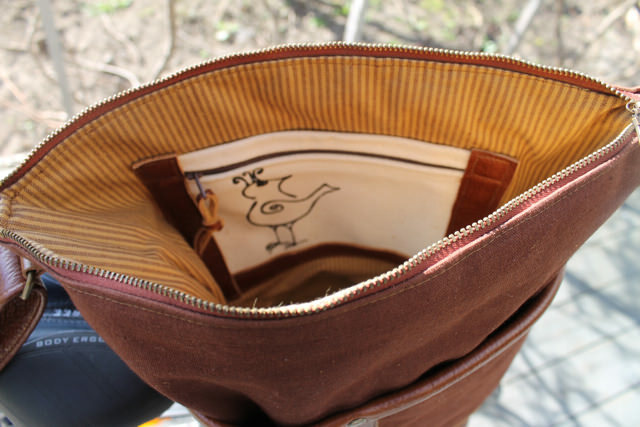 It has a large zippered exterior pocket and two inside, a leather phone slot and a birdbrain canvas slip. 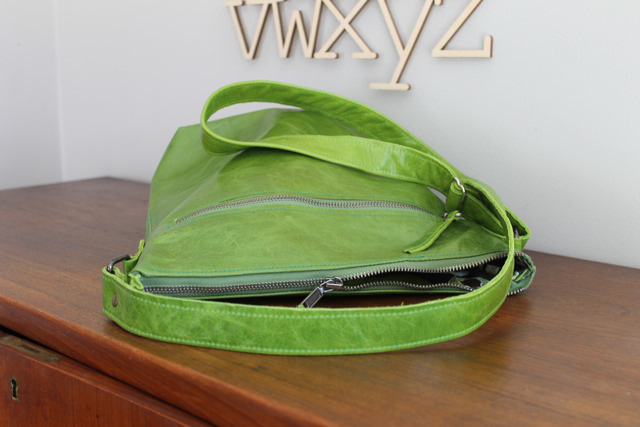 The zippers are high quality metal–I can’t see going to all the trouble of making a leather bag from scratch and then using plastic zippers. 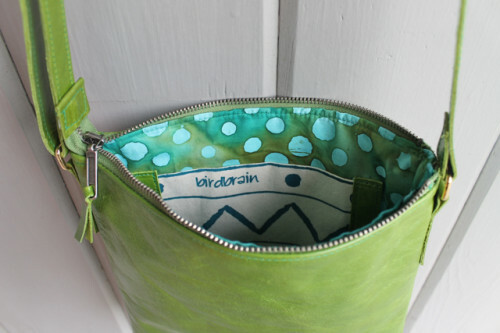 And the lining sings–turquoise and green polka dot cotton. It will make you smile each time you open the bag. 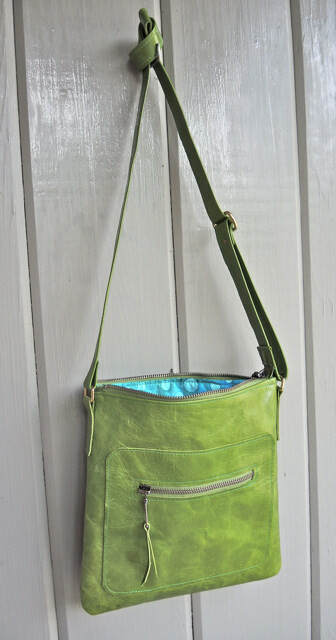 This is a cross-body bag with an adjustable strap. All seams are double sewn and the leather is backed for strength. It is 10″ tall and 10″ wide and will be in the shop tomorrow. I’ve been reorganizing my palette and sorting out all the yellows that I have collected and doing a little experimenting. 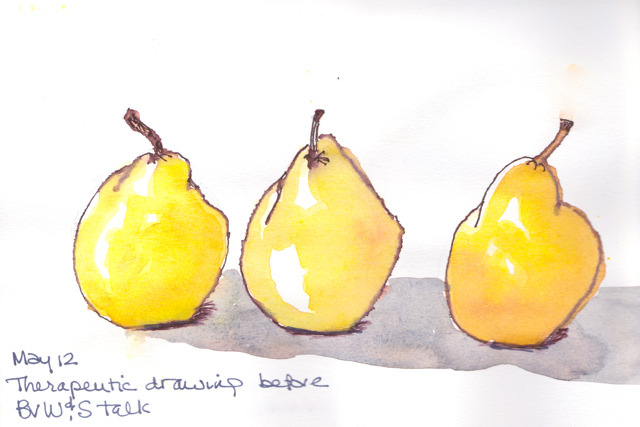 The pears were really fun, but the paper in my Fabriano Sketchbook was not happy with the soluble pen and the layers of paint–it bled right through to the back. It was ok with the light touch of the flowers above, but anything wetter causes it to bleed through. I’ve ordered a couple of watercolour moleskines for upcoming travels which handle multiple washes, but meanwhile I’ll persevere with this one. It’s a good size and fits easily in my carry bag. Yesterday I was walking home following my favourite route through the old section of the city. Our city grew up around the harbour and the river and as you walk away from its core, you are always walking up hill. My route west up Catherine Street is no exception–it is quite a steep grade. I always measure my cycling by whether I can pedal easily up this hill. 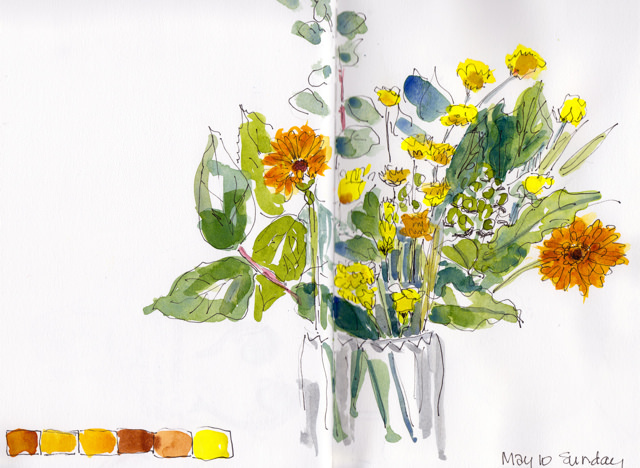 But yesterday I was walking and I had my sketchbook and an extra half hour. Across the road from this house is a low stone wall, the perfect perching spot. I drew the outline of the house from my perch on the wall and then added the colour later at home. 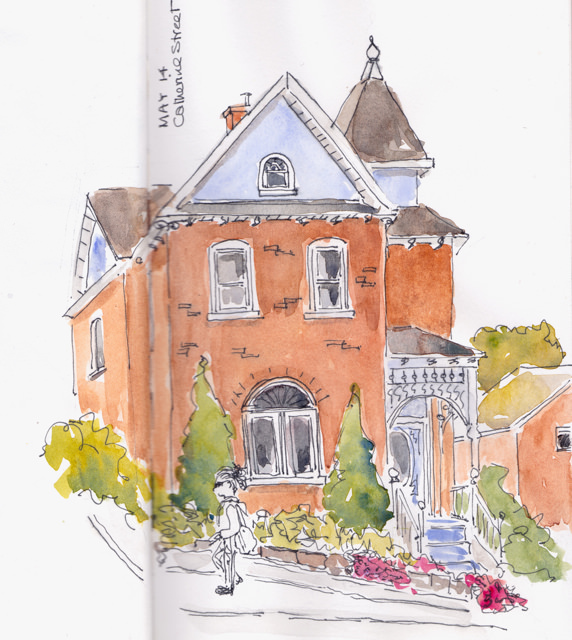 I’ve walked and pedalled by this house many times–it is one of my favourites with its peaks, turret and gingerbread– but it wasn’t til I sat down to sketch it and hence really look at it that I realized what a charmer it is. I have been doing Stretching at Sketchbook Skool and the teacher this week, France Belleville-Van Stone, asked us to draw something with wheels. She is well known for her wonderful car drawings. She loves Volvos as I do–and I have promised myself that I will draw my 10 year old Volvo soon. 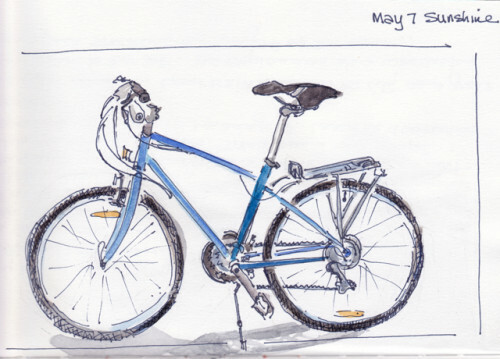 Meanwhile, I have been drawing my bike. What I really love about Sketchbook Skool is the great variety of styles we are exposed to and the unremitting encouragement to accept and hone your own style. 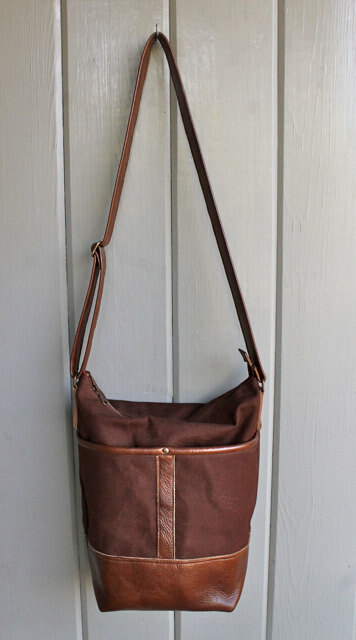 And from the studio, here are a some more pictures of the second Nairobi waxed canvas bag. 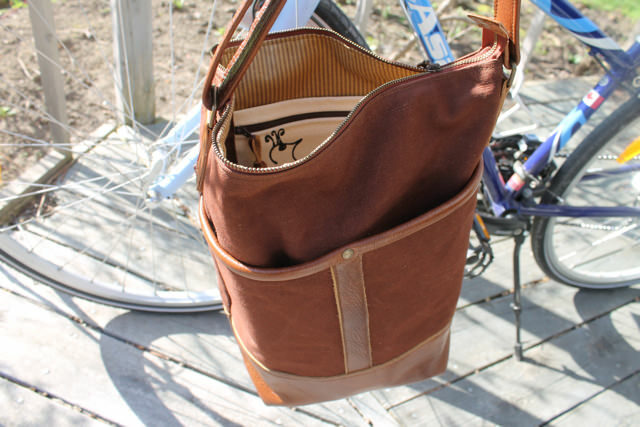 I have also been working on a messenger bag in moss waxed canvas and leather; you can see some in progress shots below. I screen printed some canoe canvas with birdbrain graphics for the lining. Canoe canvas is a good weight and gives a bag real strength. This bag is in the development stages and I am trying out various ideas. 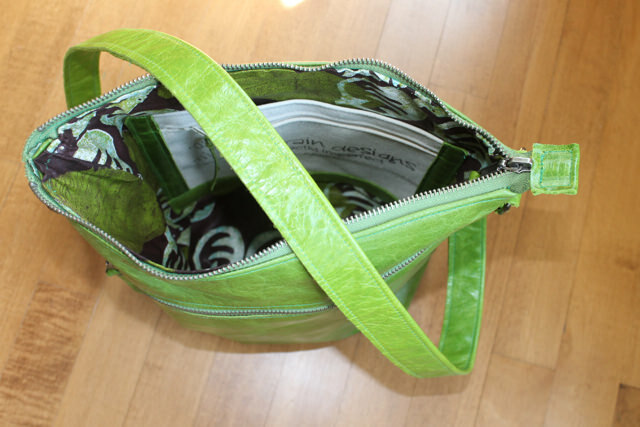 It closes with a zipper but also has an envelope style flap. 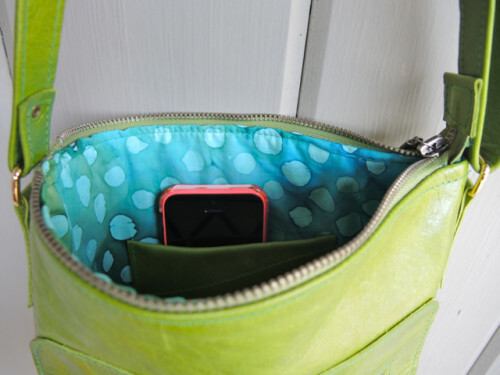 It has a zippered pocket on the back and a small slip pocket under the flap. I still have to insert the lining and add a shoulder strap. More pictures next week. 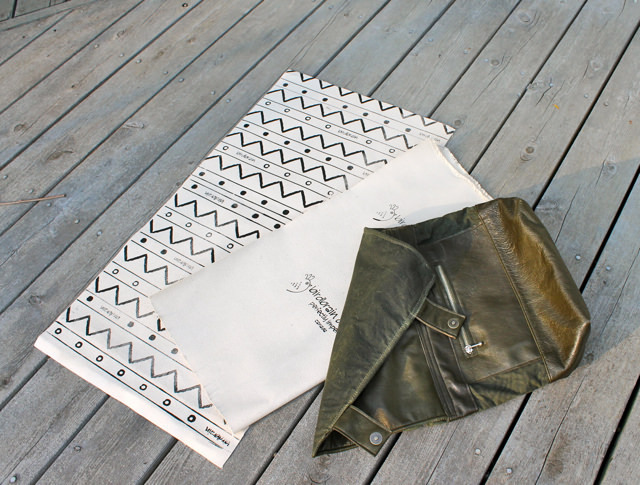 In between riding my bike and pulling dandelions I’ve been working on two new waxed canvas bags. 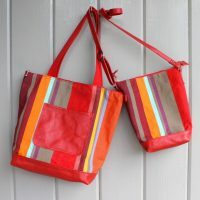 Pictured above is a second Nairobi bag, the same size as the last one, but with a few other differences. 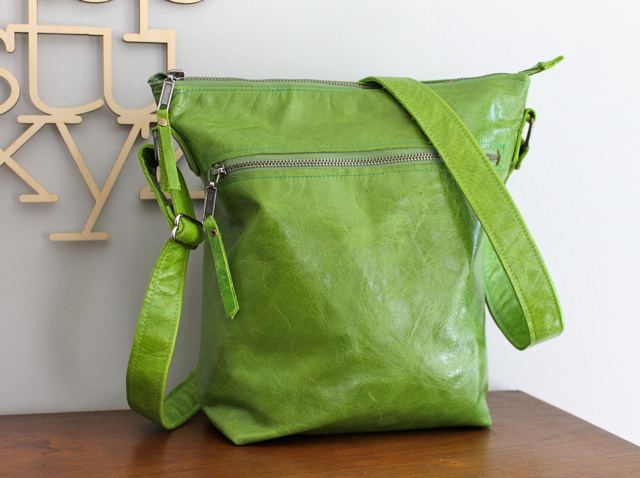 It will be available at the end of the week along, I hope, with a second bag–a new design–a moss green messenger. Back on Friday. I have been trying to sketch everyday, finding the time where I can. Sometimes these are pretty fast like the one above painted in my car while I drank a take-out coffee. On Thursday I was at the dentist and had 40 minutes between procedures. 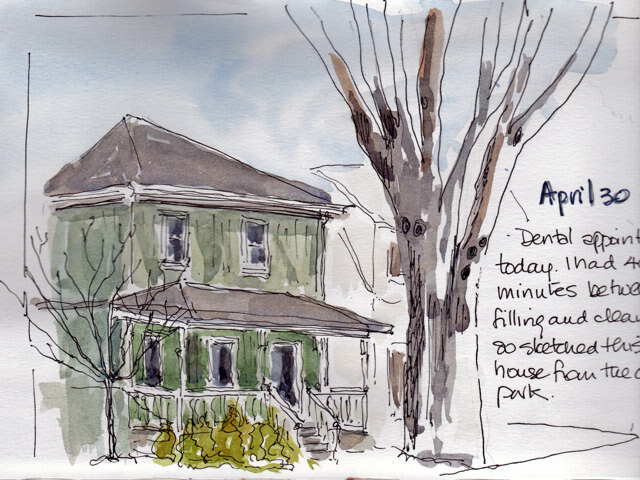 So I parked strategically and sketched the house across the way. Then yesterday I was in Toronto for the day, with the full morning at the Distillery District. 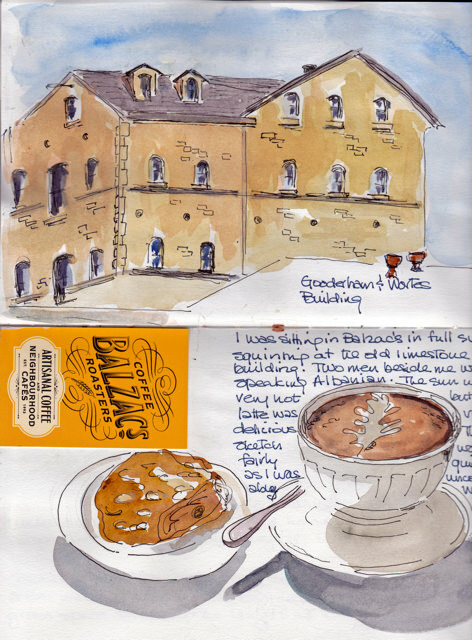 There were lots of intriguing old buildings and I sat both inside and out to sketch them. Today I sketched yesterday’s purchases. I’ve mentioned before that I purchase clothes either second hand or handmade. 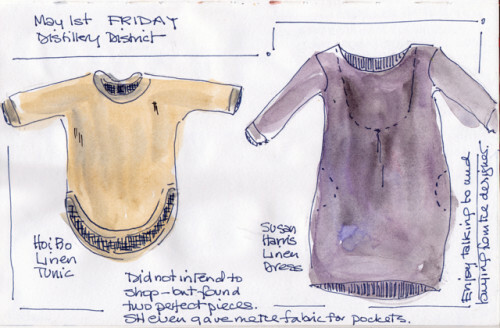 There were two great stores in the DD with the designers on hand. Susan Harris had designed the linen dress I bought–and when I said that I would have loved pockets, she gave me the extra material and drew the pocket pattern for me. Now where can you find that kind of interested support at a fast-fashion or even a high-end clothing outlet? It’s like buying a book from a small bookstore where the owner has actually read the book you are looking for. In today’s Globe and Mail there is an article on slow goods, “high quality, handmade, everyday goods, sufficiently well built…traditional materials. Time-honoured techniques are prized, sweatshops shunned.” This certainly describes the work of the two makers I purchased from yesterday…and come to think of it…the work done right here at Birdbrain designs. On the cutting table here, another cognac waxed canvas and leather bag. Check back soon to see…or contact me at the blog. 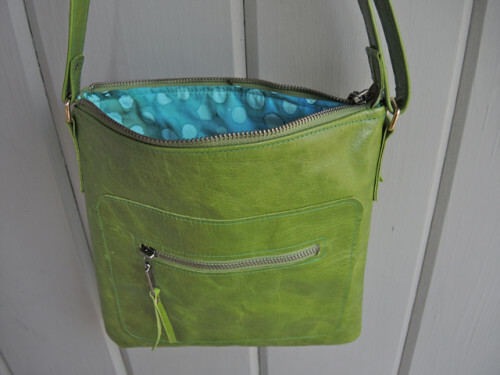 This Kiwi Bag is great for spring and summer. 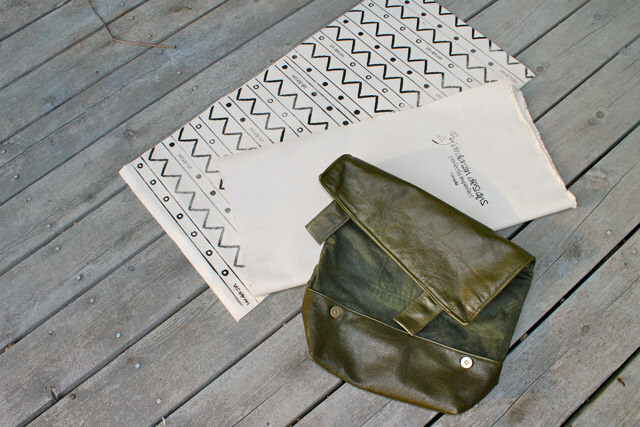 It is lined in cotton from Kenya, has a zip/slip canvas pocket inside as well as a leather phone pocket. Outside it has a generous zippered pocket and an adjustable strap. Antique metal zippers and hardware. 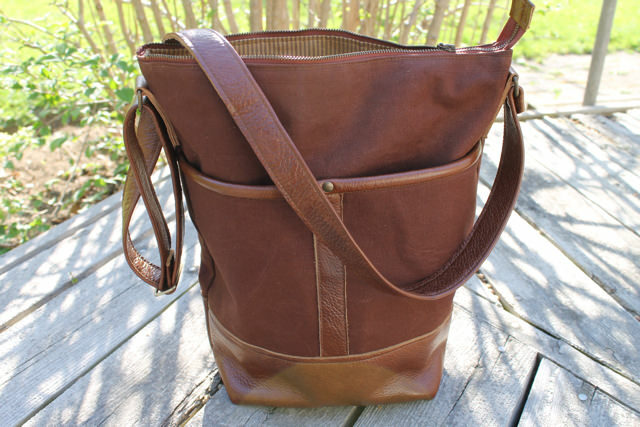 At 12″ tall, 12″wide and 4″ deep, it will carry all your essentials.